thiruvAimozhi 2.2.6 – yavarum yAvaiyum – http://divyaprabandham.koyil.org/index.php/2016/01/thiruvaimozhi-2-2-6-yavarum-yavaiyum/ . Full series can be viewed at http://divyaprabandham.koyil.org/index.php/thiruvaimozhi/ . upadhESa raththina mAlai – pAsuram 59 – http://divyaprabandham.koyil.org/index.php/2016/01/upadhesa-raththina-malai-59/ – English translation by raghurAm swamy. Full series at http://divyaprabandham.koyil.org/index.php/2015/11/upadhesa-raththina-malai/ . dhivya prabandham- upadhESa raththina mAlai – pAsuram 58 – http://divyaprabandham.koyil.org/index.php/2016/01/upadhesa-raththina-malai-58/ – English translation by raghurAm swamy. Full series at http://divyaprabandham.koyil.org/index.php/2015/11/upadhesa-raththina-malai/ . thiruvAimozhi 2.2.5 – thagum sIr – http://divyaprabandham.koyil.org/index.php/2016/01/thiruvaimozhi-2-2-5-thagum-sir/ . Full series can be viewed at http://divyaprabandham.koyil.org/index.php/thiruvaimozhi/ . upadhESa raththina mAlai – pAsuram 57 – http://divyaprabandham.koyil.org/index.php/2016/01/upadhesa-raththina-malai-57/ – English translation by raghurAm swamy. Full series at http://divyaprabandham.koyil.org/index.php/2015/11/upadhesa-raththina-malai/ . dhivya prabandham – upadhESa raththina mAlai – pAsuram 56 – http://divyaprabandham.koyil.org/index.php/2016/01/upadhesa-raththina-malai-56/ – English translation by raghurAm swamy. Full series at http://divyaprabandham.koyil.org/index.php/2015/11/upadhesa-raththina-malai/ . dhivya prabandham – upadhESa raththina mAlai – pAsuram 55 – http://divyaprabandham.koyil.org/index.php/2016/01/upadhesa-raththina-malai-55/ – English translation by raghurAm swamy. Full series at http://divyaprabandham.koyil.org/index.php/2015/11/upadhesa-raththina-malai/ . gIthArtha sangraham – Section 2 – http://githa.koyil.org/index.php/githartha-sangraham-hindi-2/ based on http://githa.koyil.org/index.php/githartha-sangraham-2/ – Hindi translation by bhagavathi ammangar. Full series can be viewed at http://githa.koyil.org/index.php/githartha-sangraham-hindi/ . SaraNAgathi gadhyam – 16th chUrNai – http://divyaprabandham.koyil.org/index.php/2016/01/saranagathi-gadhyam-16/ – English translation by T N krishNan swamy. Full series at http://divyaprabandham.koyil.org/index.php/2015/11/saranagathi-gadhyam/ . 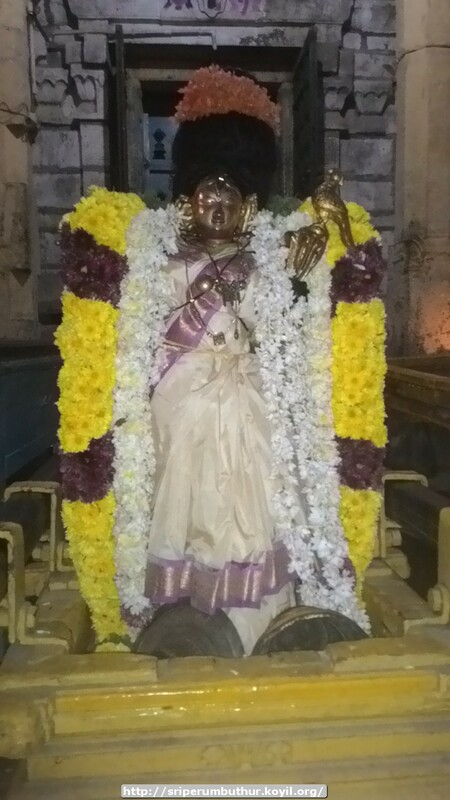 upadhESa raththina mAlai – pAsuram 54 – http://divyaprabandham.koyil.org/index.php/2016/01/upadhesa-raththina-malai-54/ – English translation by raghurAm swamy. Full series at http://divyaprabandham.koyil.org/index.php/2015/11/upadhesa-raththina-malai/ . 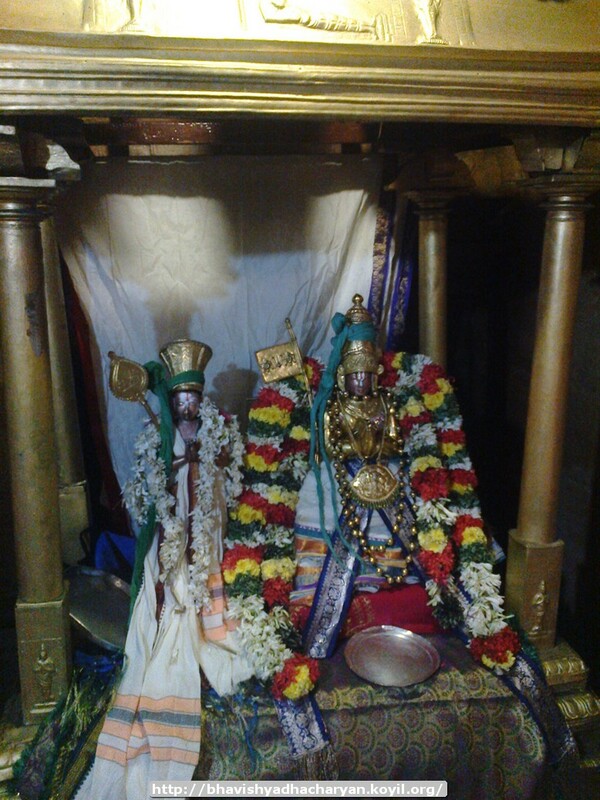 SaraNAgathi gadhyam – 14th and 15th chUrNais – http://divyaprabandham.koyil.org/index.php/2016/01/saranagathi-gadhyam-14-15/ – English translation by T N krishNan swamy. Full series at http://divyaprabandham.koyil.org/index.php/2015/11/saranagathi-gadhyam/ . upadhESa raththina mAlai – pAsuram 53 – http://divyaprabandham.koyil.org/index.php/2016/01/upadhesa-raththina-malai-53/ – English translation by raghurAm swamy. Full series at http://divyaprabandham.koyil.org/index.php/2015/11/upadhesa-raththina-malai/ . chathu: SlOkI – Conclusion – http://divyaprabandham.koyil.org/index.php/2016/01/chathu-sloki-hindi-conclusion/ based on http://divyaprabandham.koyil.org/index.php/2015/12/chathu-sloki-tamil-conclusion/ – hindi translation by prIthi ammangar. Full series at http://divyaprabandham.koyil.org/index.php/2015/01/chathu-sloki-hindi/ . SrI dhEvarAja ashtakam – hindi – e-book link available http://divyaprabandham.koyil.org/index.php/2016/01/sri-dhevaraja-ashtakam-hindi/ . Also, available at http://divyaprabandham.koyil.org/index.php/e-books/ . Thanks to parAsara (pradeep) swamy for preparing the e-book. upadhESa raththina mAlai – pAsuram 52 – http://divyaprabandham.koyil.org/index.php/2016/01/upadhesa-raththina-malai-52/ – English translation by raghurAm swamy. Full series at http://divyaprabandham.koyil.org/index.php/2015/11/upadhesa-raththina-malai/ . This entry was posted in Uncategorized on January 23, 2016 by Sarathy Thothathri. chathu: SlOkI – SlOkams – http://divyaprabandham.koyil.org/index.php/2015/12/chathu-sloki-hindi-slokams/ based on http://divyaprabandham.koyil.org/index.php/2015/12/chathu-sloki-tamil-slokams/ – hindi translation by prIthi ammangar. Full series at http://divyaprabandham.koyil.org/index.php/2015/01/chathu-sloki-hindi/ . SaraNAgathi gadhyam – 13th chUrNai – http://divyaprabandham.koyil.org/index.php/2016/01/saranagathi-gadhyam-13/ – English translation by T N krishNan swamy. Full series at http://divyaprabandham.koyil.org/index.php/2015/11/saranagathi-gadhyam/ . upadhESa raththina mAlai – pAsuram 51 – http://divyaprabandham.koyil.org/index.php/2016/01/upadhesa-raththina-malai-51/ – English translation by raghurAm swamy. Full series at http://divyaprabandham.koyil.org/index.php/2015/11/upadhesa-raththina-malai/ . thiruvAimozhi 2.1 – English e-book link available at http://divyaprabandham.koyil.org/index.php/2015/11/thiruvaimozhi-2nd-centum/ and http://divyaprabandham.koyil.org/index.php/e-books/ . Thanks to parAsara (pradeep) swamy for preparing the e-book. chathu: SlOkI – Commencement of Hindi translation by prIthi ammangar – http://divyaprabandham.koyil.org/index.php/2015/01/chathu-sloki-hindi/ based on http://divyaprabandham.koyil.org/index.php/2015/12/chathu-sloki/ . thaniyan available at http://divyaprabandham.koyil.org/index.php/2016/01/chathu-sloki-hindi-thaniyan/ based on http://divyaprabandham.koyil.org/index.php/2015/12/chathu-sloki-tamil/ . upadhESa raththina mAlai – pAsuram 50 – http://divyaprabandham.koyil.org/index.php/2016/01/upadhesa-raththina-malai-50/ – English translation by raghurAm swamy. Full series at http://divyaprabandham.koyil.org/index.php/2015/11/upadhesa-raththina-malai/ . bhagavath gIthA – SlOkams 20 to 25 added in http://githa.koyil.org/index.php/chapter-1/ based on http://githa.koyil.org/index.php/chapter-1-original/ . dhivya prabandham – upadhESa raththina mAlai – pAsuram 49 – http://divyaprabandham.koyil.org/index.php/2016/01/upadhesa-raththina-malai-49/ – English translation by raghurAm swamy. Full series at http://divyaprabandham.koyil.org/index.php/2015/11/upadhesa-raththina-malai/ . gIthArtha sangraham – Section 1 – http://githa.koyil.org/index.php/githartha-sangraham-hindi-1/ based on http://githa.koyil.org/index.php/githartha-sangraham-1/ – Hindi translation by bhagavathi ammangar. Full series can be viewed at http://githa.koyil.org/index.php/githartha-sangraham-hindi/ . dhivya prabandham – upadhESa raththina mAlai – pAsuram 48 – http://divyaprabandham.koyil.org/index.php/2016/01/upadhesa-raththina-malai-48/ – English translation by raghurAm swamy. Full series at http://divyaprabandham.koyil.org/index.php/2015/11/upadhesa-raththina-malai/ . emperumAnAr dharisana nAtkuRippu – Spiritual diary 2016-17 from SrIvaramangA nAchiyAr sabhA – online copy available at http://vanamamalai.us/index.php?option=com_content&view=article&id=395:emperumanar-dharisana-kurippedu-spiritual-diary&catid=65:articles&Itemid=117. SrIvaishNava granthams – virOdhi parihArangaL part 6 – https://srivaishnavagranthamshindi.wordpress.com/2016/01/18/virodhi-pariharangal-6/ based on http://ponnadi.blogspot.in/2013/12/virodhi-pariharangal-6.html – hindi translation by kEshav swamy. Full series can be viewed at https://srivaishnavagranthamshindi.wordpress.com/virodhi-pariharangal/ . dhivya prabandham – upadhESa raththina mAlai – pAsuram 47 – http://divyaprabandham.koyil.org/index.php/2016/01/upadhesa-raththina-malai-47/ – English translation by raghurAm swamy. Full series at http://divyaprabandham.koyil.org/index.php/2015/11/upadhesa-raththina-malai/ . SaraNAgathi gadhyam – 12th chUrNai – http://divyaprabandham.koyil.org/index.php/2016/01/saranagathi-gadhyam-12/ – English translation by T N krishNan swamy. Full series at http://divyaprabandham.koyil.org/index.php/2015/11/saranagathi-gadhyam/ . upadhESa raththina mAlai – pAsuram 46 – http://divyaprabandham.koyil.org/index.php/2016/01/upadhesa-raththina-malai-46/ – English translation by raghurAm swamy. Full series at http://divyaprabandham.koyil.org/index.php/2015/11/upadhesa-raththina-malai/ . thiruppAvai quiz – new quizzes section in SrIvaishNava Education Portal – Starting with the auspicious thiruppAvai quiz – http://pillai.koyil.org/index.php/2016/01/thiruppavai-quiz/ . dhivya prabandham – upadhESa raththina mAlai – pAsuram 45 – http://divyaprabandham.koyil.org/index.php/2016/01/upadhesa-raththina-malai-45/ – English translation by raghurAm swamy. Full series at http://divyaprabandham.koyil.org/index.php/2015/11/upadhesa-raththina-malai/ . bhagavath gIthA – SlOkams 17 to 19 added in http://githa.koyil.org/index.php/chapter-1/ based on http://githa.koyil.org/index.php/chapter-1-original/ . upadhESa raththina mAlai – pAsuram 44 – http://divyaprabandham.koyil.org/index.php/2016/01/upadhesa-raththina-malai-44/ – English translation by raghurAm swamy. Full series at http://divyaprabandham.koyil.org/index.php/2015/11/upadhesa-raththina-malai/ . Audio rendering of upadhEsa raththina mAlai – remaining pAsurams (51 to 74) pAsurams uploaded – http://divyaprabandham.koyil.org/index.php/2015/12/upadhesa-raththina-malai-audio/ . SrIvaishNava granthams – Simple guide to SrIvaishNavam – References – http://ponnadi.blogspot.com/2016/01/simple-guide-to-srivaishnavam-references.html . Full series at http://ponnadi.blogspot.in/p/simple-guide-to-srivaishnavam.html . With this, the series comes to an end. thiruvAimozhi 2.2.4 – thEvum epporuLum – http://divyaprabandham.koyil.org/index.php/2016/01/thiruvaimozhi-2-2-4-thevum-epporulum/ . Full series can be viewed at http://divyaprabandham.koyil.org/index.php/thiruvaimozhi/ . upadhESa raththina mAlai – pAsuram 43 – http://divyaprabandham.koyil.org/index.php/2016/01/upadhesa-raththina-malai-43/ – English translation by raghurAm swamy. Full series at http://divyaprabandham.koyil.org/index.php/2015/11/upadhesa-raththina-malai/ . gIthArtha sangraham – Commencement of Hindi translation by bhagavathi ammangar – http://githa.koyil.org/index.php/githartha-sangraham-hindi/ based on http://githa.koyil.org/index.php/githartha-sangraham/ . thiruvAimozhi 2.2.3 – ERanaip pUvanai – http://divyaprabandham.koyil.org/index.php/2016/01/thiruvaimozhi-2-2-3-eranaip-puvanai/ . Full series can be viewed at http://divyaprabandham.koyil.org/index.php/thiruvaimozhi/ . upadhESa raththina mAlai – pAsuram 42 – http://divyaprabandham.koyil.org/index.php/2016/01/upadhesa-raththina-malai-42/ – English translation by raghurAm swamy. Full series at http://divyaprabandham.koyil.org/index.php/2015/11/upadhesa-raththina-malai/ . thiruvAimozhi 2.2.2 – EpAvam paramE – http://divyaprabandham.koyil.org/index.php/2016/01/thiruvaimozhi-2-2-2-epavam-parame/ . Full series can be viewed at http://divyaprabandham.koyil.org/index.php/thiruvaimozhi/ . upadhESa raththina mAlai – pAsuram 41 – http://divyaprabandham.koyil.org/index.php/2016/01/upadhesa-raththina-malai-41/ – English translation by raghurAm swamy. Full series at http://divyaprabandham.koyil.org/index.php/2015/11/upadhesa-raththina-malai/ . SrI rAmAnuja dharSanam – e-magazine – November/aippasi – hindi Issue recently released and can be viewed at http://www.varavaramuni.com/home/sriramanuja-dharsanam-magazine/hindi . bhagavath gIthA – SlOkams 14 to 16 added in http://githa.koyil.org/index.php/chapter-1/ based on http://githa.koyil.org/index.php/chapter-1-original/ . periya thirumozhi munnadi/pinnadi e-book link available at http://divyaprabandham.koyil.org/index.php/e-books . Thanks to thiruvEnkataththAn swamy for preparing the same. SaraNAgathi gadhyam – 11th chUrNai – http://divyaprabandham.koyil.org/index.php/2016/01/saranagathi-gadhyam-11/ – English translation by T N krishNan swamy. Full series at http://divyaprabandham.koyil.org/index.php/2015/11/saranagathi-gadhyam/ . upadhESa raththina mAlai – pAsuram 40 – http://divyaprabandham.koyil.org/index.php/2016/01/upadhesa-raththina-malai-40/ – English translation by raghurAm swamy. Full series at http://divyaprabandham.koyil.org/index.php/2015/11/upadhesa-raththina-malai/ . thiruvAimozhi 2.2.1 – thiNNan vIdu – http://divyaprabandham.koyil.org/index.php/2016/01/thiruvaimozhi-2-2-1-thinnan-vidu/ . Full series can be viewed at http://divyaprabandham.koyil.org/index.php/thiruvaimozhi/ . upadhESa raththina mAlai – pAsuram 39 – http://divyaprabandham.koyil.org/index.php/2016/01/upadhesa-raththina-malai-39/ – English translation by raghurAm swamy. Full series at http://divyaprabandham.koyil.org/index.php/2015/11/upadhesa-raththina-malai/ . 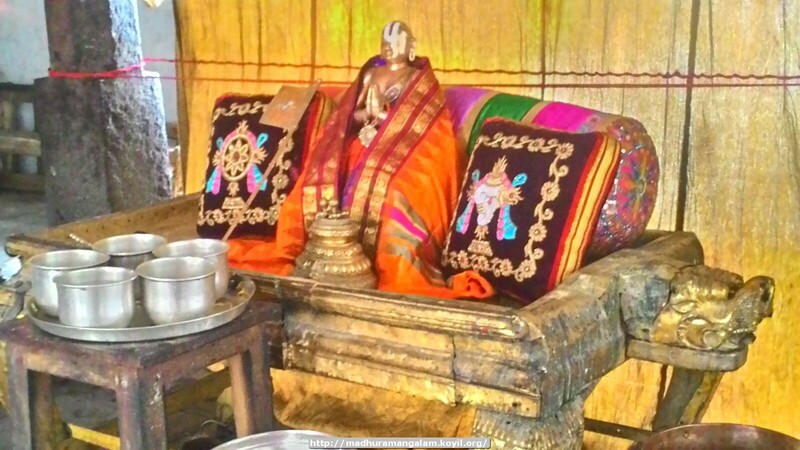 guru paramaparai – thiruvEnkata embAr rAmAnuja jIyar – life and glories in thamizh – https://guruparamparaitamil.wordpress.com/2016/01/09/sriperumbuthur-first-embar-jiyar/ – new article by rAmAnujan swamy based on https://guruparamparai.wordpress.com/2013/08/28/sriperumbuthur-first-embar-jiyar/ . Please visit https://guruparamparaitamil.wordpress.com/2015/03/14/introduction-2/ to see the full list. SrI dhEvarAja ashtakam hindi translation by bhagavathi ammangar at http://divyaprabandham.koyil.org/index.php/2016/01/sri-dhevaraja-ashtakam-hindi/ based on http://divyaprabandham.koyil.org/index.php/2015/12/sri-dhevaraja-ashtakam/ . SrI dhEvarAja ashtakam – English/thamizh – e-book links available http://divyaprabandham.koyil.org/index.php/2015/12/sri-dhevaraja-ashtakam/ and http://divyaprabandham.koyil.org/index.php/2015/12/sri-dhevaraja-ashtakam-tamil/ . Also, available at http://divyaprabandham.koyil.org/index.php/e-books/ . Thanks to parAsara (pradeep) swamy for preparing the e-book. upadhESa raththina mAlai – pAsuram 38 – http://divyaprabandham.koyil.org/index.php/2016/01/upadhesa-raththina-malai-38/ – English translation by raghurAm swamy. Full series at http://divyaprabandham.koyil.org/index.php/2015/11/upadhesa-raththina-malai/ . This entry was posted in Uncategorized on January 9, 2016 by Sarathy Thothathri.
. Also, available at http://divyaprabandham.koyil.org/index.php/e-books/ . Thanks to parAsara (pradeep) swamy for preparing the e-book. 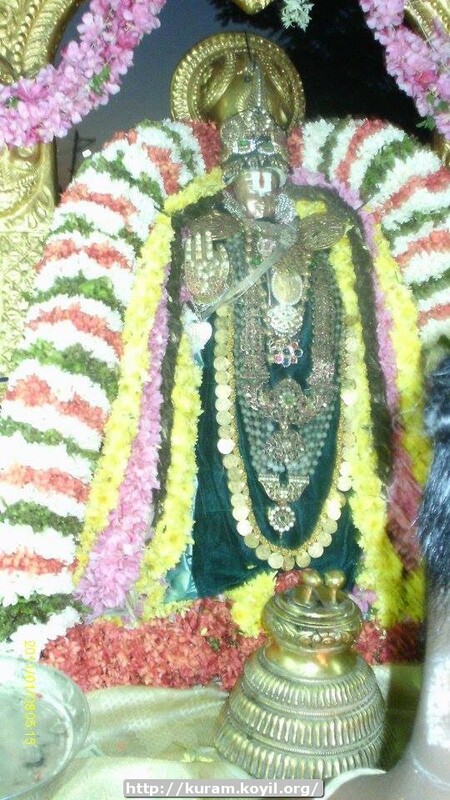 Commencement of thiruvAimozhi 2.2 – http://divyaprabandham.koyil.org/index.php/2016/01/thiruvaimozhi-2-2-thinnan/ (resumption of thiruvAimozhi translation). Full series can be viewed at http://divyaprabandham.koyil.org/index.php/thiruvaimozhi/ . Audio of the same can be listened at http://divyaprabandham.koyil.org/index.php/2016/01/thiruvaimozhi-2-2-audio/ . SaraNAgathi gadhyam – 10th chUrNai – http://divyaprabandham.koyil.org/index.php/2016/01/saranagathi-gadhyam-10/ – English translation by T N krishNan swamy. Full series at http://divyaprabandham.koyil.org/index.php/2015/11/saranagathi-gadhyam/ . upadhESa raththina mAlai – pAsuram 37 – http://divyaprabandham.koyil.org/index.php/2016/01/upadhesa-raththina-malai-37/ – English translation by raghurAm swamy. Full series at http://divyaprabandham.koyil.org/index.php/2015/11/upadhesa-raththina-malai/ . SrIvaishNava granthams – Simple guide to SrIvaishNavam – Important points for daily routine – http://ponnadi.blogspot.com/2016/01/simple-guide-to-srivaishnavam-important-points.html . Full series at http://ponnadi.blogspot.in/p/simple-guide-to-srivaishnavam.html . upadhESa raththina mAlai – pAsuram 36 – http://divyaprabandham.koyil.org/index.php/2016/01/upadhesa-raththina-malai-36/ – English translation by raghurAm swamy. Full series at http://divyaprabandham.koyil.org/index.php/2015/11/upadhesa-raththina-malai/ . 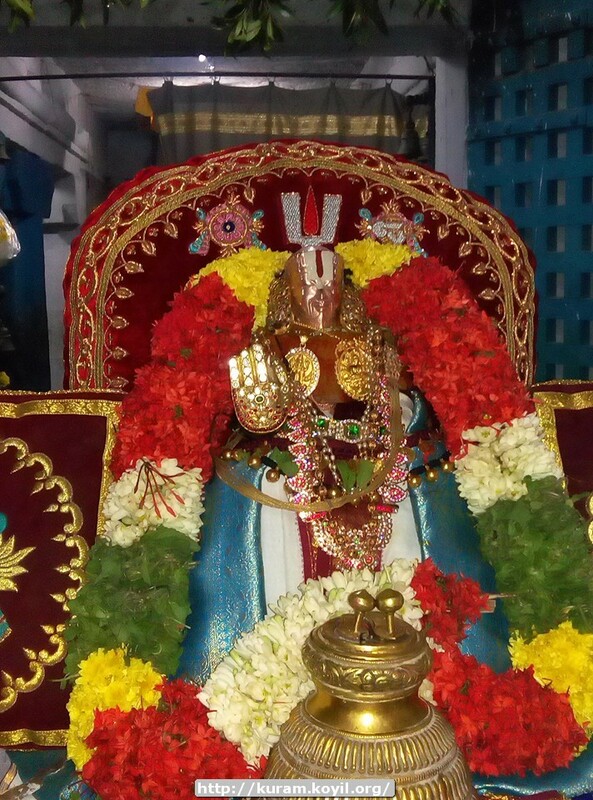 guru paramaparai – thiruvarangap perumAL araiyar – life and glories in thamizh – https://guruparamparaitamil.wordpress.com/2016/01/06/thiruvarangapperumal-arayar/ – new article by chakravrathi swamy based on https://guruparamparai.wordpress.com/2013/01/12/thiruvarangapperumal-arayar/ . Please visit https://guruparamparaitamil.wordpress.com/2015/03/14/introduction-2/ to see the full list. ashta SlOkI – SlOkams (with meanings) in English and thamizh added at – http://divyaprabandham.koyil.org/index.php/2016/01/ashta-sloki/ and http://divyaprabandham.koyil.org/index.php/2016/01/ashta-sloki-tamil/ respectively. upadhESa raththina mAlai – pAsuram 35 – http://divyaprabandham.koyil.org/index.php/2016/01/upadhesa-raththina-malai-35/ – English translation by raghurAm swamy. Full series at http://divyaprabandham.koyil.org/index.php/2015/11/upadhesa-raththina-malai/ . – new article in hindi by bhagavathi ammangar based on http://ponnadi.blogspot.in/2013/11/aippasi-anubhavam-mudhalazhwargal-emperumanar.html . Full series can be seen at https://srivaishnavagranthamshindi.wordpress.com/thula-masa-anubhavam/ . With this, thulA mAsa anubhavam series is completed. bhagavath gIthA – SlOkams 7 to 13 added in http://githa.koyil.org/index.php/chapter-1/ based on http://githa.koyil.org/index.php/chapter-1-original/ . ashta SlOkI – Commencement of English translation by vangIpuram satakOpan swamy – http://divyaprabandham.koyil.org/index.php/2016/01/ashta-sloki/ based on simple explanation in thamizh by nyAya vidhvAn dhAmal vangIpuram pArthasArathy aiyengAr swamy http://divyaprabandham.koyil.org/index.php/2016/01/ashta-sloki-tamil/ . thaniyan in English and thamizh can be viewed at http://divyaprabandham.koyil.org/index.php/2016/01/ashta-sloki-thaniyan/ and http://divyaprabandham.koyil.org/index.php/2016/01/ashta-sloki-tamil-thaniyan/ respectively. upadhESa raththina mAlai – pAsuram 34 – http://divyaprabandham.koyil.org/index.php/2016/01/upadhesa-raththina-malai-34/ – English translation by raghurAm swamy. Full series at http://divyaprabandham.koyil.org/index.php/2015/11/upadhesa-raththina-malai/ . 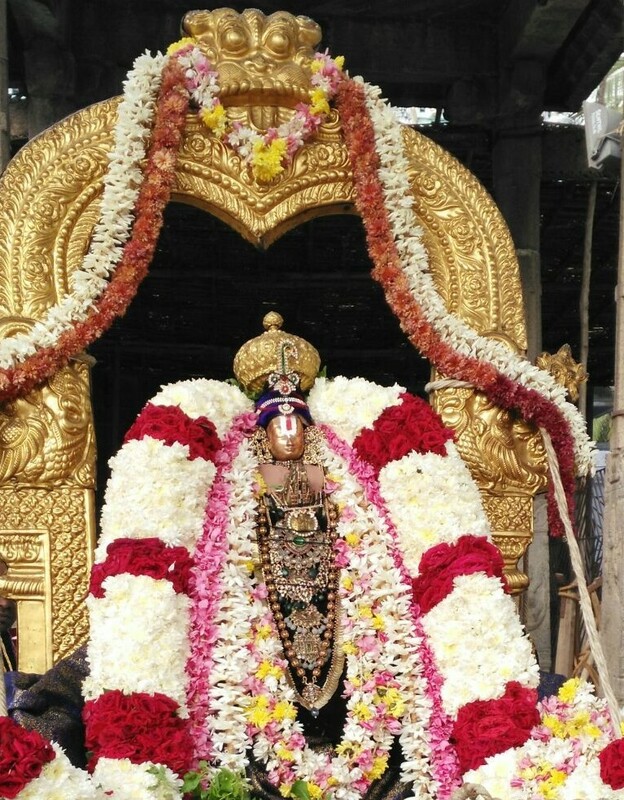 adhyayana uthsavam special – AzhwArthirungari thiruvadi thozhal (nammAzhwAr vaikuNtOthsavam completion – final 3 days) anubhavam (detailed narration of the wonderful events) – http://azhwarthirunagari.koyil.org/?page_id=907 . – new article in hindi by bhagavathi ammangar based on http://ponnadi.blogspot.in/2013/11/aippasi-anubhavam-pillai-lokacharyar-sri-vachana-bhushanam-3.html . Full series can be seen at https://srivaishnavagranthamshindi.wordpress.com/thula-masa-anubhavam/ . upadhESa raththina mAlai – pAsuram 33 – http://divyaprabandham.koyil.org/index.php/2016/01/upadhesa-raththina-malai-33/ – English translation by raghurAm swamy. Full series at http://divyaprabandham.koyil.org/index.php/2015/11/upadhesa-raththina-malai/ . – new article in hindi by bhagavathi ammangar based on http://ponnadi.blogspot.in/2013/11/aippasi-anubhavam-pillai-lokacharyar-sri-vachana-bhushanam-2.html . Full series can be seen at https://srivaishnavagranthamshindi.wordpress.com/thula-masa-anubhavam/ . SaraNAgathi gadhyam – 8th and 9th chUrNais – http://divyaprabandham.koyil.org/index.php/2016/01/saranagathi-gadhyam-8-and-9/ – English translation by T N krishNan swamy. Full series at http://divyaprabandham.koyil.org/index.php/2015/11/saranagathi-gadhyam/ . pramEya sAram – remaining six pAsurams – English translation by santhAnam swamy – published by vEnkatEsh swamy – http://divyaprabandham.koyil.org/index.php/2015/12/prameya-saram/ . With this pramEya sAram English is completed. upadhESa raththina mAlai – pAsuram 32 – http://divyaprabandham.koyil.org/index.php/2016/01/upadhesa-raththina-malai-32/ – English translation by raghurAm swamy. Full series at http://divyaprabandham.koyil.org/index.php/2015/11/upadhesa-raththina-malai/ . – new article in hindi by bhagavathi ammangar based on http://ponnadi.blogspot.in/2013/11/aippasi-anubhavam-pillai-lokacharyar-sri-vachana-bhushanam-1.html . Full series can be seen at https://srivaishnavagranthamshindi.wordpress.com/thula-masa-anubhavam/ . upadhESa raththina mAlai – pAsuram 31 – http://divyaprabandham.koyil.org/index.php/2016/01/upadhesa-raththina-malai-31/ – English translation by raghurAm swamy. Full series at http://divyaprabandham.koyil.org/index.php/2015/11/upadhesa-raththina-malai/ . chathu: SlOkI – English/thamizh – e-book links available at http://divyaprabandham.koyil.org/index.php/2015/12/chathu-sloki/ and http://divyaprabandham.koyil.org/index.php/2015/12/chathu-sloki-tamil/ . Also, available at http://divyaprabandham.koyil.org/index.php/e-books/ . Thanks to parAsara (pradeep) swamy for preparing the e-book.